Adventures learning about life, art, and entrepreneurship. Okay, so a week or so ago, I was telling you all about how disappointed I was with my first glaze firing. Since I am trying to learn from my mistakes, I would welcome any input from you knowledgeable potters out there. Currently, I do not have my own kiln, so I am paying a neighborhood studio for use of their glazes and kiln. Therefore, I cannot do much altering of their glazes, except for application methods and mixing together of colors in small enough batches to use up on my own pots. I will outline the issues I had, then follow with the photographs below. 1- Saki set. Glaze is Scott’s Red. 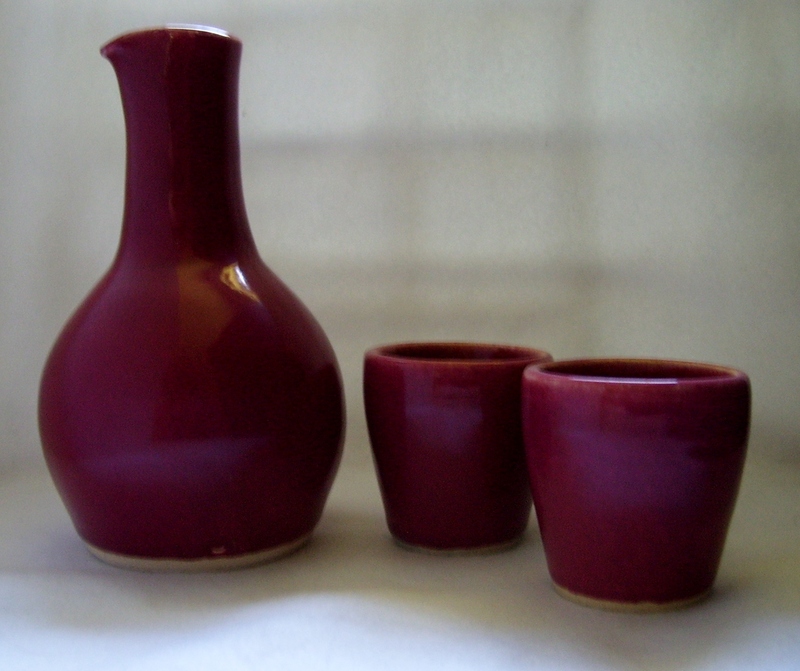 I generally like this glaze, although it tends to lean more towards pink/cranberry. I did have some issues with pinholing (not much, though), and ended up with a large bare spot inside one of the cups. Never had that happen before! 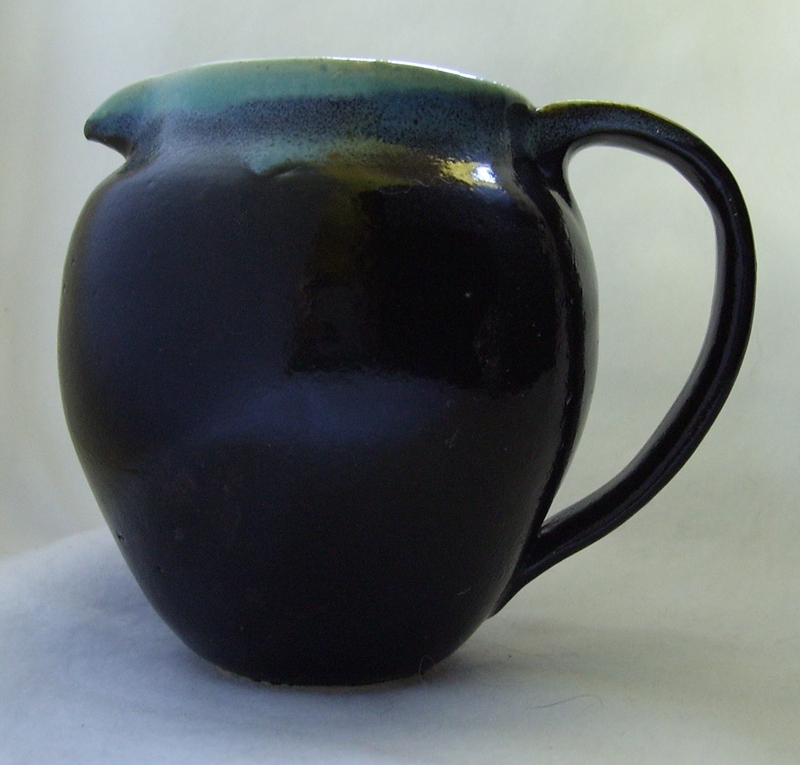 Someone suggested that an air bubble during firing could cause this, pushing the glaze up, and making it “fold” over itself. Could this be correct? I am intending to refire these. 2- Creamer. Glazes are Licorice and Panama Red. Since I fired in oxidation, the Panama turns turquoise, which I love. But the Licorice pinholed badly on ALL the pieces I used it on! Is there a way around this, other than maybe adding a layer of clear glaze? I love how the glazes look on the area where they overlap, and would like to do this over an entire pot, but not if it’s going to be totally pockmarked! 3- Goblet. 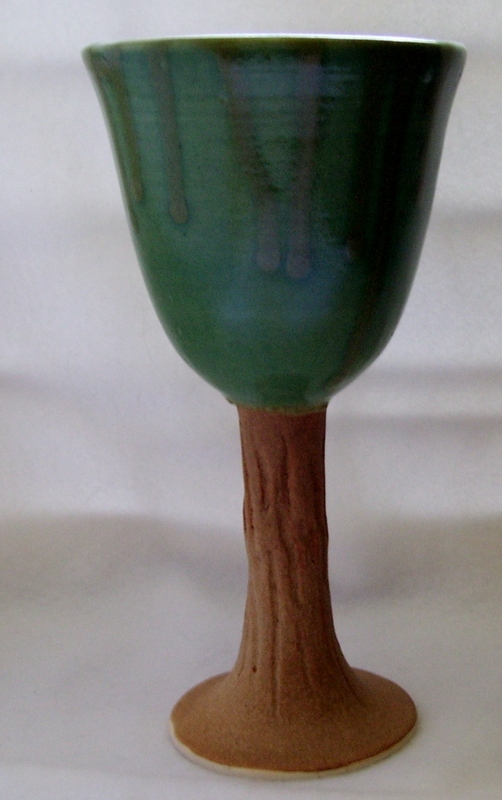 Glazes are Bottle Glass Green, Warm Jade Green (drips), and Nutmeg. My problem with this one was the Nutmeg. It is supposed to be a warm, toasty brown. Instead, I got something that looks underfired, and also looks and feels like sandpaper. I was going for a rough look, but not that rough! I had another piece in the same batch that the Nutmeg did this on, and the studio very graciously refired it for me. But there was no change. The studio assistant was just as perplexed as I am about it. 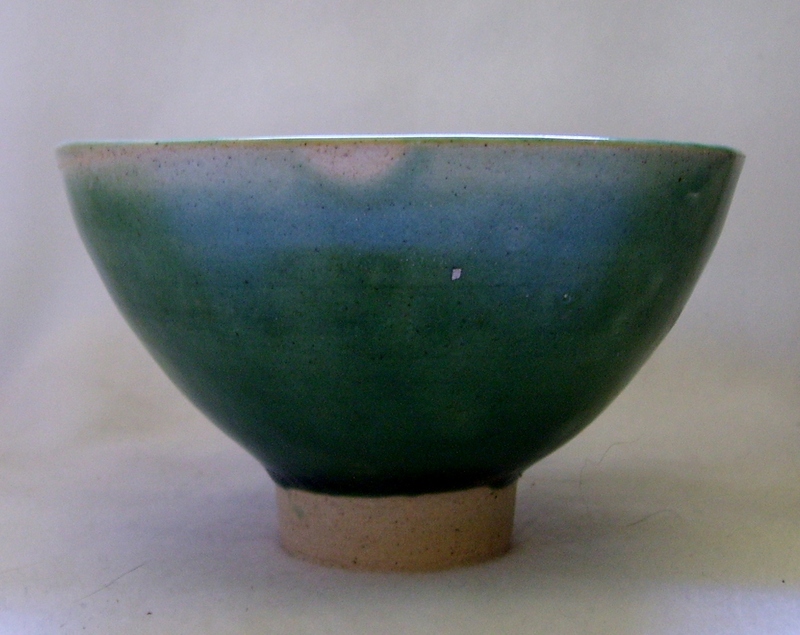 4- Teabowl. Glass Bottle Green, with Panama Red interior. The interior of this bowl is great! There is a big area where I dripped the Green over the Panama, and the effect is wonderful, although I couldn’t get a good picture of it. But on the outside… sigh! The Green is supposed to be a semi-transparent glaze, but I wasn’t expecting it to leave me bare clay in places! If anyone has any tips for working with this glaze, I sure would appreciate it. Well, that’s all I’ve got for today. Have a fantastic remainder of the week! Hi Stephanie, I’m certainly no expert but the main things I know of that cause pinholing are dust on your bisque ware, ie it needs to be really clean before glazing, or too higher temp bisque firing making it difficult for your glaze to adhere properly. Take a look at http://digitalfire.com/4sight/troubleshooting/ceramic_troubleshooting_glaze_pinholing_pitting.html for much more information. PS I still think they look lovely tho. Thanks, Juliet. I will take a look at those links. I know that dust can cause pinholing, and that may have very well been the problem. However, I find it very strange that over 90% of it was on the pieces I used that Licorice glaze on. The studio assistant told me (afterwards!) that it happens to almost everyone who uses that glaze. It’s puzzling.